Plot: A group of experts who specialize in testing security systems for companies find themselves in over their heads when they get their hands on a mysterious black box. Review: There have been many movies that have tackled the subject of computer hacking over the years. Some were really good (ie: "War Games") and some were laughably horrendous (ie: "Hackers"). Sneakers is the one that never seems to get enough credit when people talk about computer hacker films. Maybe it's because not enough people ever saw it, but make no mistake... this is the greatest hacker movie out there if you ask me. First off, the film has a fantastic cast. Robert Redford, Ben Kingsley, Sidney Poitier, Dan Aykroyd, James Earl Jones, Mary McDonnell, David Strathairn, Stephen Tobolowsky and the late River Phoenix. When you have an impressive cast like that, all you need is a good script along with a capable director and you're pretty much guaranteed to have a winner on your hands. 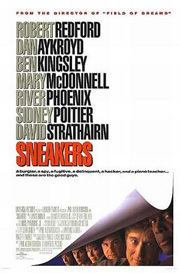 Sneakers definitely won me over the first time I saw it. Rather than getting ridiculously sci-fi and using "virtual reality" to hack into systems like more modern hacking movies have done, Sneakers approaches the subject from a far more realistic standpoint. Pretty much everything that takes place in the movie is believable and it tackles some interesting subject matter in the process (cryptography, conspiracy theories, anagrams, espionage, etc.). Another nice thing about the film is that while it is a serious thriller, there are still plenty of comedic interactions between various members of the cast. My particular favorites are when Donald Crease (Poitier) and Mother (Dan Aykroyd) get into arguments about conspiracy theories. Mother is a huge conspiracy theorist, and some of his theories are pretty far out there. Believe me when I say that watching Crease grow increasingly impatient with him is pretty damned amusing. When it comes down to it though, the story at its core is about two college friends whose lives went in dramatically different directions after one of them was arrested. I can't recommend this movie enough to any of you who haven't seen it yet. It has everything you could ask for - a great story and cast, thrills, action and comedy. And honestly, it's how the film is grounded in reality along with the ingenious ideas that the writers came up with (particularly with the blind character "Whistler" and his incredible sense of hearing) that has made it a timeless classic in my eyes. I'll never get tired of watching the team try to pull off the ultimate "sneak", and I doubt you will either if you give this movie a shot. Believe it or not I was just thinking about this movie. I'm in complete agreement, it is awesome, made even moreso by the lack of technobabble. My favorite line - "I'll be ready as soon as I finish pounding these breasts." Another - "Pain, Marty? Try prison." I love their solution to getting through a comination lock. and of course that should be combination lock. Damn this HP laptop!!!!! I remember watching with my mom the first time she visited me at college. Shoebox theater in tiny college town. sigh nostalgia. I have to disaggree with you, Rog. Hacker was hilarious. Best. Hacking. Movie. Ever. As Colonel Flagg before me, for some strange reason this has been airing in Latin America's CineMax and Movie City recently, and having seen it like 3 times in the last week its fresh on my mind. This is a favourite of my brother, and I didn't got the hang of it until recently, when I saw it complete. Is a fairly interesting movie with both suspense and humor (yeah, the combination lock part and when they guide Whistler through a small bump in the road) that make it a enjoyable film. P.S. : in another channel (I think MGM or something like that) they have a weekly showing of Hackers. It's nice to remember those times when computers in movies were über-powerful... And they had no sense of fashion. I saw it in theaters, liked it well enough. Just... gimme da bax, Mahty! "I want peace on Earth and goodwill toward men." "We're the United States Government. We don't do that sort of thing!" I think this was one of those movies that everyone liked. It's just so awesome no one can say anything bad about it. I never would have thought I'd like Robert Redford as a hacker. Who knew? Oh guess what I just saw on Comcast On Demand for free? was it "hackers 2: this time the viruses are in 3-d for some reason"? This movie was excellent. Not Where Eagles Dare but then what is? Seriously - in total agreement. If you haven't seen it, you're missing out! This streams instantly on Netflix for those with an account.